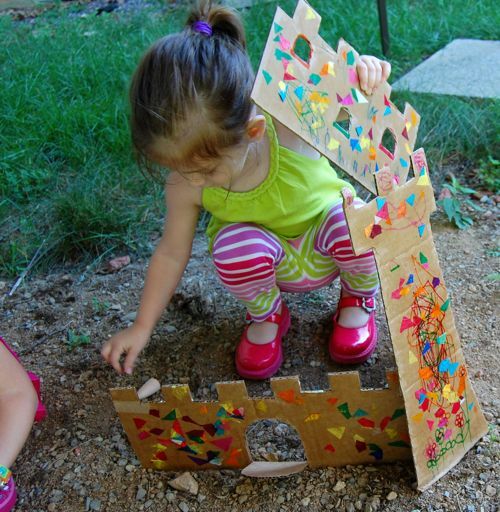 We made this cardboard castle set, and it kept the girls happy and busy for a large part of this afternoon. For something as frugal as cardboard, it was a big hit! 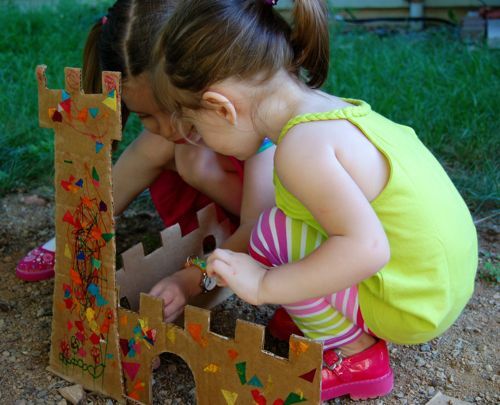 Not only did they spend a lot of time immersed in pretend play, but they also really enjoyed getting to decorate the castle exactly the way they wanted. We did a sort of assembly-line style production. I cut the cardboard, Clara did some scribbling…..
…. 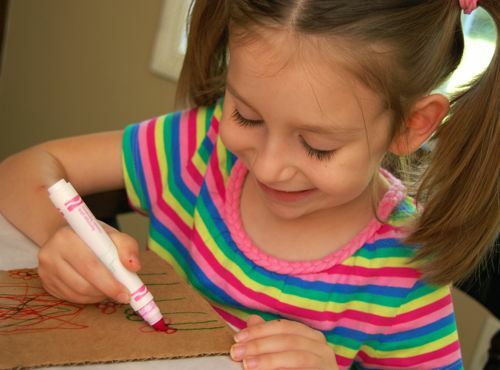 then Emily took over to put on the finishing touches of flower drawings and glue on bits of colorful tissue paper! With the help of a bit of wire, I was able to make a working drawbridge! The girls LOVED that!! I enjoyed watching them come up with all sorts of different configurations for their castle. The peg dolls seemed right at home here…. Hello, peg doll! It was starting to get dark outside, and they were still having so much fun! Finally, it was time to get dinner started, but I have a feeling we’ll be enjoying a lot more play time with this castle for the next couple of days…. (or weeks)! I have some exciting things planned for our little bloggy-blog: Mark and I have been hard at work on a new layout that will make finding activities by theme, age, holiday, etc. SO much easier! There’s even a section for “quick and easy” activities, and you can upload photos of your versions of our projects to share!! I was saving that cardboard for something incredibly awesome, and you knew it. Pack it up, folks, the party is over. How fun – but can you describe for inept crafters like myself – how did you make the castle reconfigurable? Did you cut the slits in the cardboard, so the pieces can slide into each other? I really like the tissue paper accents – they give it a magical, stone kind of look. Very nice! great project. My kids will love it! 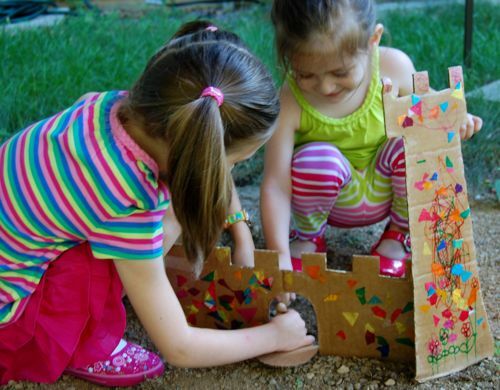 Cardboard boxes are the ultimate favorite toy of all kids— they can transform into anything! @ Raising a Happy Child — We kept it really simple and the girls made grooves in the dirt to keep the walls propped up. I think having them slide into each other as you described would be a great way to do this too — especially for indoor play! @ Childhood Magic — I totally agree!!! I am excited for the new changes sounds great! We have the same peg people. I am very excited about your new additions to the blog! Very cool! 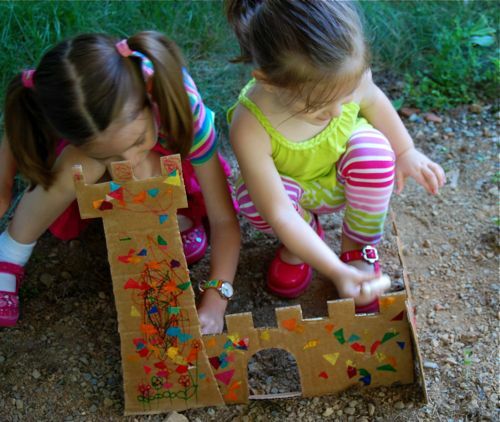 Making a castle is on our summer bucket list, so we might make this one! i knew i was saving that cardboard from earlier today for something! thanks! looking forward to seeing the 'new look'! @ danita — I was thinking the other day that I NEVER buy cardboard. We almost always have some that can be recycled. 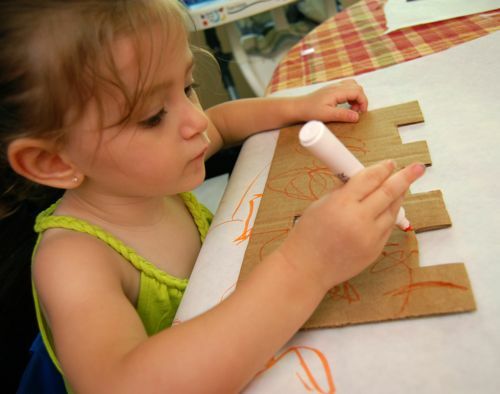 The corrugated cardboard can be used for SO many different projects! Have fun!! I want one!How did you cut the card board? I just used kitchen scissors to cut it, and it worked okay, though I’m sure there is a better way to get the cuts to be more even. Maybe with an exact-o knife. Thanks, Philippa! I’m not sure which part they enjoyed more — the decorating, or all the pretend play! You new site layout sounds awesome – and I love the castle! 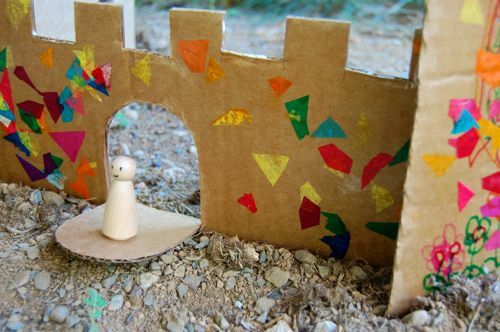 It’s amazing how much fun something as simple as a few sheets of cardboard can be! 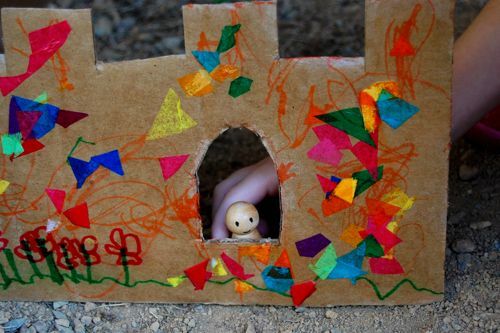 I still can’t get over how much fun kids have with cardboard — amazing! That would be wildly popular here too! What a wonderful idea. Thanks so much! I’m so glad you stopped by too, thanks! Very cute… I love how the castle looks. The girls are dressed so cute today (well, they’re cute all the time). Is Emily telling time? I meant to ask you that when I first noticed her wearing a watch. Emily is starting to tell time, and it definitely helps that she has her own little wrist watch to practice with that. It was a Christmas gift, and she adores it! AWESOME and DARLING!! The perfect castle for any princess!!!! !